A relief map is a three-dimensional model that shows the features of a particular region, like mountains and valleys, to scale. You've probably all seen one at some stage, perhaps you've even built one. However, I don't suppose you've ever thought that a relief map might provide a starting point for scientific research. But thanks to one influential Australian geologist, that's just what happened. During the Second World War, military planners were concerned about the lack of detailed maps of Northern Australia. Acting on the advice of the professor of Geology at the University of Melbourne, Edwin Sherbon Hills, they decided to construct a relief model of the area. Once completed, data from the model was to be used to draw up the required maps. 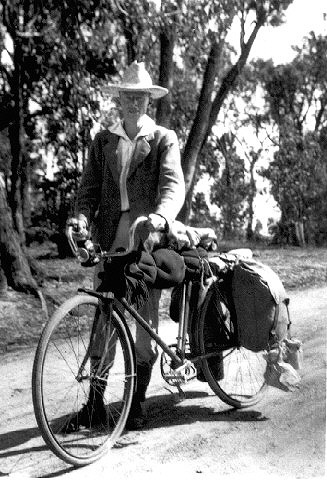 Hills was seconded to the Army, and for three months travelled with an Observer Unit across Northern Australia collecting data for the model. The journals of explorers and early settlers provided additional information, and soon construction was underway. Hills was so impressed by the possibilities of the relief model that he continued and extended the project after the war. By the 1950s, he had completed a model of the entire continent of Australia (with Papua New Guinea thrown in for good measure). When assembled, the model was some eight metres across! While working on the model Hills had noticed some interesting regularities. Most striking was the way that many features of the landscape -- such as rivers, basins and mountain ranges -- seemed to form geometric patterns made up of linked or intersecting straight lines. Hills suggested that these lines (called lineaments) gave important clues about the underlying geological structure of the continent. This insight has proved to be extremely valuable, especially in identifying ore deposits, and many geologists have built upon Hills' pioneering work in the field he described as "morphotectonics". This episode also provides a good example of Hills's gift for lateral thinking. Unlike many modern scientists, he did not confine his researches to a narrow area of specialisation. His interests varied widely across geology -- including palaeontology, coastal features, arid lands, hydrology and economic geology -- enabling him to take a broad view of any problem and to make connections that might otherwise have been missed. This breadth of vision was evident even in the late 1920s when, as a young geology student, Hills was set the task of investigating the geology of the Cathedral Ranges, near Melbourne. The field work was difficult, perhaps even dangerous, but his efforts were rewarded by the discovery of fossil remains of fish from the Devonian period (about 400 million years ago). This find was highly significant from a palaentological point of view, but Hills also recognised that the fossils provided him with a useful means of dating other geological features in the area. In a similar way, Hills always appreciated the importance of strong links between research and teaching, and between science and the community. Former students remember him as an exciting lecturer, highly skilled with blackboard and chalk! His text-books on structural geology were published in several editions, including Russian, Spanish and Indian. He served on many national and international committees, and worked as a consultant to Unesco, helping countries such as Indonesia and Sri Lanka develop their geological training facilities. Many scientists are remembered for their breakthroughs or their discoveries, but perhaps Edwin Hills will be best remembered for the way he approached his science -- for his curiosity, his insight and his enthusiasm. Previously published in Australasian Science, vol. 2, no. 1, Autumn 1993, p. 56.